I appreciate the Bad Daddies sending this split my way after covering their great Bad Year EP a while back but a couple of things that are blowing my mind is that Emotional Response Records is Jen Turrell and her husband Stewart Anderson from Boyracer. I know of Jen through a six volume seven inch series she did back in 2000 called The Way Things Change. I must have emailed her at some point because I remember hearing this came in some sort of case or hand screened canvas bag or something and she said they were long sold out but I ordered the whole series because of the number of great artists involved, The Microphones, The Softies, Mirah, Jen and Boyracer of course and Calvin Johnston to name a few. According to Discogs she's also the daughter of James Turrell the artist who created an observatory out of a crater near Flagstaff Arizona. The world gets smaller, but what does the single sound like? Well the A-Side is from Lognhalsmottagningen (you bet I have to cut and paste that every time) a duo? of Stewart (from the label) from Flagstaff and Martin from Gothenburg, Sweden who get all fired up on three tracks this side. "Btt strategiskt vakuum" opens right into feedback alternating between snare hits before opening up into bigger riffs. I have to appreciate doing this in Swedish after all why wouldn't we want to hear what those guys were up to over there in their native language. People complain how ignorant Americans are for not learning any other languages and now you can start singing along to this at least. Constantly changing super fast punk and honestly if you told me this was in English I might not even really notice, sometimes those lyrics you make up when you're half paying attention are even better. Oh stupid American. "Det ar val bra som det ar" handclaps and a bass line? There must be a few more members on this track, the lyric follows that hyper bass and they always manage a catchy melody in the midst of this chaos that seems perfectly suited to be lost in translation. It's reminding me of The Descendents or DRI, pushing speed and content above anything else. Bashes from cymbals and strings. "I nypressad folkdrakt och med tvattad hals" opens on feedback, I mean if you have this stuff turned up because it's going to be loud that hearing damage is what you're going to get. A guitar melody actually take shape between verses and the chorus becomes a weird version of rawhide. The vocals barely have room to finish each sentence and their off again trying to do more damage somewhere else. Worth getting into. I'd love to see a translation of this lyric sheet, it looks like they have a lot to say or else that's just the way Swedish is. The B-Side from Bad Daddies manages one more track for four starting with "Dessert" the vocals sounding harsher than I remember, really damaging the throat and that bass is pushing things way into the red. The brief stabs I can catch are sharp and they left before I could even find out what they wanted. "The Flood" tight snare roll versus this random electric jagged track, the yelling is nicely pushed in the back in the perfect upset volume. Love the lack of distortion here, they manage to get away with this punk sound no matter what effects are running through the amps, really like this one, that punk energy and minimal jangle with the pounding kit. So weird it isn't punk which means it is. "Spare Change" feedback and heavy snare, the thicker distortions here are squealing which seems to fire up the vocal in that MOM AND DAD I"M IN JAIL way. Taking out the trash at the speed of double nickels on a dime. Low layered squelches are just as important as the rapid fire bursts they deliver. "Bad Year" has the dirtiest guitar and Camylle (?) does a brief Kim Deal sounding melody behind the huge riffs that come together in a really pop way, I don't know why that seems surprising but this one should be on repeat if you can find that narrow band on the vinyl which means you should go replay the whole thing, but what teases! You can't even repeat anything? it makes me feel stupid I can hardly get into it. Throw in my goldfish memory and I already forgot how it goes. 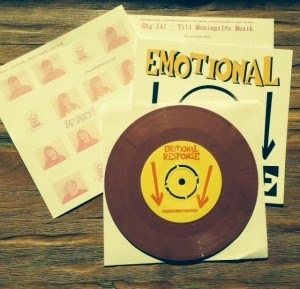 Get this from Emotional Response Records on random colors. I got a greyish one from The Daddies (thanks ladies and gents).